Zebra, provider of technology solutions to identify, track, and manage the deployment of critical assets, announced that the South Carolina State Ports Authority plans to use its Web-based Navis SPARCS N4 terminal operating system to govern the movement of container logistics and operations from a central location across multiple sites. 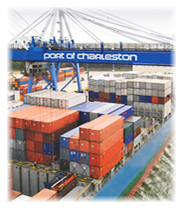 By 2011, the SCSPA will utilize the SPARCS N4 to manage container and breakbulk cargo operations across six marine terminals, including Wando Welch, North Charleston, Columbus Street, Union Pier and Veterans, all in the Port of Charleston, and the Port of Georgetown. The SCSPA handles $44 billion in cargo and 1.28 million twenty-foot equivalent units, a standard measure in intermodal transport. With the new system, customers will be provided centralized visibility of information, as well as enhanced communication with SCSPA via web-based electronic data interchange.